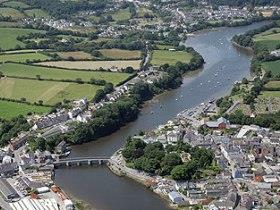 Cardigan/Aberteifi TownAn ancient Welsh cultural and commercial centre along the Teifi estuary on the West Wales coast, today, Cardigan or Aberteifi as it is known in Welsh, is a busy market town which boasts a number of annual cultural festivals. The town's buildings are predominately Georgian and Victorian in style, many of which are in use as fashionable boutiques, traditional shops, inns and places to eat and socialise. There is a wealth of local food producers in the surrounding area, and their produce is found on many menus throughout the town. For the intrepid gastronome, Cardigan also offers a bustling River and Food Festival in August each year. Cardigan Castle reopened in 2015 as a heritage attraction, restaurant, accommodation and events venue, after a £12m restoration project. The town was founded in 1093 by the Norman Roger de Montgomery. In 1176 Cardigan Castle - by then in Welsh hands - became the site of the first competitive Eisteddfod. An 'Eisteddfod' is a Welsh festival of literature, music and performance. A chair at the Lord's table was awarded to the best poet and musician, a tradition that prevails in the modern day National Eisteddfod - indeed, the word Eisteddfod is derived from the Welsh word eistedd, meaning to "sit". Cardigan Castle was built in 1100, by Gilbert de Clare and if he had have realised what trouble this was to cause, he may not have bothered. Over the next 100 years the castle frequently changed hands between the Norman’s and the Welsh. De Clare’s son gained control of the castle in 1136, the same year that Rhys ap Gruffydd, the prince of Deheubarth, or Lord Rhys, led the defeat of the Norman’s in the town at the bloody battle of Crug Mawr. His prize was the castle which he set about transforming from its original wooden structure into stone. Rhys was the proud owner of the castle, up until his death in 1197, which marked the beginning of another period of conflict. His sons, Maelgwyn and Gruffyd, disputed their inheritance resulting in Maelgwyn surrendering Gruffydd to the Norman’s and selling the Castle to King John. A variety of Norman owners called Cardigan Castle home until Llywellyn the Great attacked and destroyed the castle in a show of strength. In what now looks like a historical tug-of-war the Norman William Marshal was next to take control, followed by the Welsh and then yet another Norman. After this final Norman conquest, during the 1240s, the castle was reconstructed. Two towers, a new keep and the town wall were all built to create the stronghold, the ruins of which are visible to visitors today. By the end of the 13th century it was King Edward 1st who had laid claim to the castle. Peace the reigned for almost four centuries, 1645 and the English Civil War, when Oliver Cromwell took it upon himself to storm the battlements. Such was the damage that the castle lay uninhabited until the early 1800s when a private mansion was built on the property marking the end to the turmoil that has given Cardigan Castle the unique heritage it boasts today. Today the port of Cardigan is used mostly by leisure crafts; however at the beginning of the 19th century over 300 sailing vessels were registered and more than 200 ships were built in the five shipyards. One of the main exports was Cilgerran slate, but unfortunately, a build up of silt on the river bed towards the end of the 19th century limited the size of vessels that could enter the port, and by the early part of the twentieth century, it was virtually abandoned. The port area has undergone a renaissance and today it as an attractive leisure harbour and waterfront area for the town. The garment that shares its appellation with the town is actually named after the 7th Earl of Cardigan, James Brudenell, and the battle of Balaclava. An ancient Welsh cultural and commercial centre along the Teifi estuary on the West Wales coast, today, Cardigan or Aberteifi as it is known in Welsh, is a busy market town which boasts a number of annual cultural festivals. One of the more unusual facts about Cardigan is that it is the site of Wales' premier Roman Catholic Shrine. Before the Reformation, the statue was known as 'The Virgin Mary, who held a candle whose flame never extinguished. Today, it is know as the shrine to Our Lady of the Taper.